The limited progress in improving livelihoods of smallholder farmers and pastoralists is a major challenge for the international, sub-regional and national agricultural research community to have greater impact. In 2002 a technology exhibition and workshop, organized by the Ethiopian Ministry of Agriculture and Rural Development (MoARD) and the International Livestock Research Institute (ILRI) concluded that the technologies which have been developed by the international, national and sub-regional research organizations were not benefiting the rural population to the extent desired. 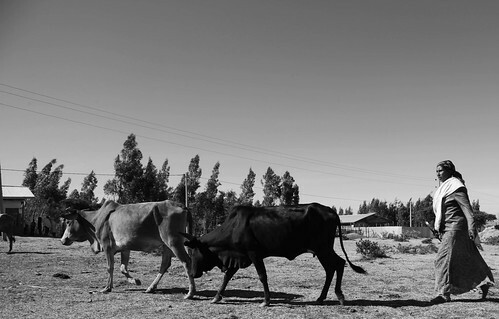 Based on this, ILRI in collaboration with other research organizations was requested to design a project which would lead to increased uptake and impact of technologies for smallholder farmers and pastoralists in Ethiopia. Following the Ethiopian government’s newly introduced strategy, the project was mandated to focus on market-orientated agricultural development, including private sector involvement. Based on these general directions, the IPMS project was designed as a research-for-development project, to be implemented in four Regional States (Amhara, Oromiya, SNNPR and Tigray) using Pilot Learning Woredas (PLW), aimed at assisting the MoARD to develop a more efficient system to give a fillip to market-oriented agricultural development. ILRI is implementing the project on behalf of the MoARD. A number of international, national, and regional research and development partners collaborate in the implementation of project activities. The Government and people of Canada fund the project through the Canadian International Development Agency (CIDA). An agreement for the use of these funds was signed between ILRI and CIDA which came into effect on June 18, 2004 and expires on March 31, 2010. A Project Implementation Plan (PIP) was developed in collaboration with the stakeholders and partners and submitted to the MoARD and CIDA in December 2004. Approval of the PIP was obtained in March 2005, and implementation of activities commenced in April 2005.